Fence Workshop™ knows all too well that not all black vinyl coated chain link fences are the same. 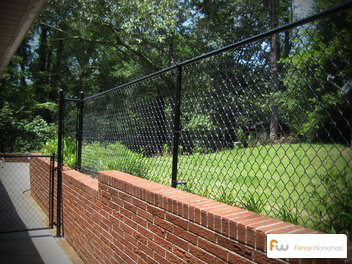 When selecting a residential vinyl coated chain link fence provider, be sure to ask questions and inquire into both the quality of the materials used and the installation techniques. At Fence Workshop™, we supply quality fencing that we’re proud of and that satisfies our customers beyond their expectations. We offer customers in Florida, Georgia, North Carolina and South Carolina a product they can trust to be top-of-line. We invite you to see what makes our vinyl coated chain link fences different from the rest. Our black vinyl (PVC) coated chain link fence consists of domestic, 9 gauge finish and galvanized steel chain link core, rather than the much lower quality imported, compressed black wire mesh commonly seen in the Southeast. These residential black vinyl/PVC coated chain link fences have both a top rail and a bottom “tension wire” with posts set on 10 foot centers. Terminal posts are posts with a larger diameter, set at each end, each turn, and any point in the fence line where the angle of the fence deviates more than 20 degrees, and on both sides of any gate. At each terminal post, the chain link stops and is attached to the post with tension bands and tension straps. All terminal posts are set in belled holes with pre-mixed concrete and Quick-Rok™. This means that the base of the post holes are wider than the top, which makes the concrete much stronger (over 3x the psi of regular concrete) and helps it cure faster. Our black vinyl coated chain link fencing can secure and protect your backyard without costing an arm and a leg. If you’re a contractor or someone looking to do it yourself, our black chain link materials are available for purchase and delivery. Black vinyl coated chain link fencing is on average 50% less in overall project cost than ornamental steel or aluminum fence options. Want a Custom Built Gate for Your Unique Needs? Our chain link gates can be fabricated in-house to accommodate for any size or design. Please contact us to discuss pricing for supply of our domestically manufactured residential black vinyl coated chain link gates, which include standard gate hardware. Our friendly staff would love to help, so send us an email at info@fenceworkshop.com to get started.